You know when you get that craving for chocolate and there is nothing you can do about it except to give in? That happens to me weekly. I looked in my pantry and wondered what would go good with this chocolate craving and saw a jar of marshmallow creme staring me right in the face. Chocolate and marshmallow go perfect together in my book. Mix all ingredients together and roll into small balls. Gently flatten.Bake 350 F for 8-10 minutes. BUT DO NOT OVER BAKE! Its better to be a little undercooked but not over cooked. The softer the better. Beat butter and marshmallow creme until smooth. Mix in salt and vanilla. Add in powdered sugar and milk. Adjust levels of powdered sugar and milk to get to desired consistency-adding more powdered sugar to make it thicker and more milk to make it thinner. You could just leave the Marshmallow Frosting to speak for itself, or you can keep going with the awesomeness and add a layer of chocolate frosting too! Beat ingredients together adjusting milk/powdered sugar to get desired consistency. When cookies are cooled, spread on Marshmallow Creme Frosting. Next spread on a little chocolate frosting. Oh, my God!!! This is amazing!! Awesome! I love how simple the cookies are. And I'm like you, almost daily I need my chocolate fix! Those look impossibly decadent. I feel like I am going to gain five pounds just looking at the screen! They look perfect for a chocolate craving! these look sooo yummy! Thanks for sharing the recipe! oh my gosh that looks yummy! my favorite part: I have all those ingredients in my pantry right now! 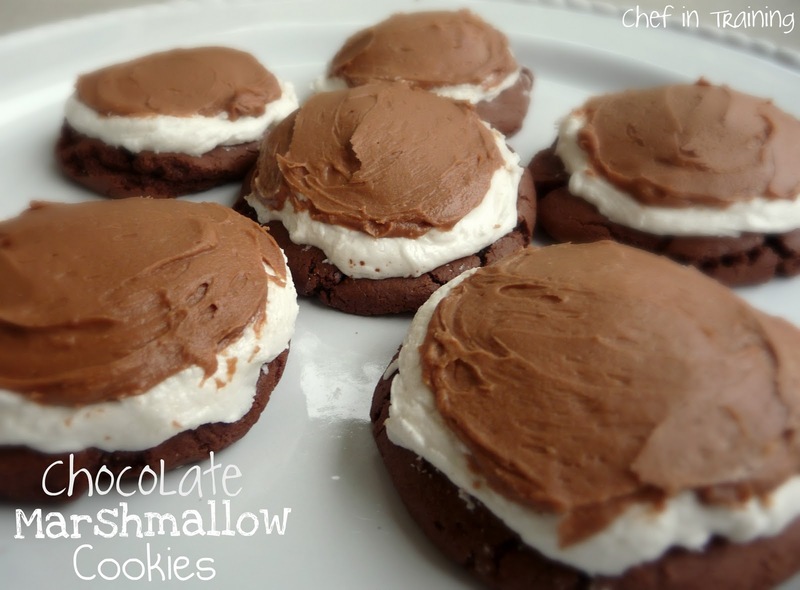 omgosh, chocolate and marshmallow is one of my favorite combos. These look to die for! oh wow...these look sooo good :) can't wait to try them out! check out my own marshmallow desserts on my blog - they may look messy but believe me they're to die for! OMG, I could eat all of them!